Films with a Pure Flix logo are available to stream on Pure Flix. Start Your Free Trial at PureFlix. Watch Faith & Family Movies. Blue Like Jazz A college freshman, Don, leaves the Bible belt to pursue the liberal arts. Although he’s experiencing a lifestyle that lacks Christianity for the first time in his life, he ultimately learns what life is about. Cautionary Notes: Rated PG-13 for elements found on the average college campus, such as language, drugs, and lust. Camp While experiencing issues from being moved into a group foster home, young Eli is sent to Royal Family Kids Camp. There he is paired with counselor Ken, who is only there to impress a business client. Together they discover the power of camp, and more importantly, the importance of caring for others. Cautionary Notes: Rated PG-13 for elements common in foster care situations, such as abuse and rebellion. Another Note: Proceeds from this movie help fund Royal Family Kids Camp, which provides free camps to foster children across the nation. Courageous Policemen give their all while in uniform, but at home, that can be a different story! When a family tragedy strikes, Adam Mitchell and his friends make a commitment to God, their wives, and their kids, to put their best foot forward. Cautionary Notes: Rated PG-13 for criminal activity, such as violence and implied drug use. End Of The Spear Based on a true story of several missionaries who are murdered by a native tribe in the Ecuadorian jungle, the families of the victims make a surprising gesture by going to live with these Waodani people. This story of martyrdom turns into a story of salvation! Cautionary Notes: Rated PG-13 for the obviously graphic nature of primal murder. Extreme Days After graduating junior college, four guys take a bro road trip to Mexico. When one of them discovers that his grandfather died and left him a car, they decide to turn around and head to the car in Washington, enjoying extreme adventures and new surprises all along the way. Facing the Giants A Christian school’s football team has had such a horrible losing streak, the coach is at risk of losing his much-needed job. When he and the team dedicate their games to God, whether they win or lose, things may take a turn, both on and off the field! Fireproof Caleb and Catherine’s marriage has been on the rocks for quite some time, but when Caleb tells his dad that he’s in the beginning stages of divorce, his father asks him to hold off for one month while practicing The Love Dare. Could this save a broken marriage? Grace Unplugged Grace Trey can’t understand why her dad traded his life as a rock star for a career as a worship pastor. When she gets the opportunity to follow in his former footsteps, she runs off to Hollywood to live the life she’s always wanted… or is it? Cautionary Notes: Rated PG, but Grace develops an underage drinking problem that never comes with consequence nor has a confirmed resolution. God’s Not DeadWhen Josh is asked to write “God is Dead” in his philosophy class, his refusal to do so forces him into the opportunity to prove to his classmates- and eventually the entire world, that there is indeed a God, and God’s not dead! Cautionary Notes: Although rated PG, there are some questionable elements, such as non-Christians being villainized. Also check out the sequel, God’s Not Dead 2. I Can Only Imagine You’ve heard the song on Christian radio for years. Now discover the true story behind the song. Bart Millard grew up with an abusive father before joining the band MercyMe. Join him on his life journey to mercy and forgiveness. Cautionary Notes: Abuse is implied but violence is rarely shown in order for the film to keep its PG rating. I’m Not Ashamed Based on the inspiring true story in the midst of the Columbine Shooting, follow teenager Rachel Joy Scott’s life, including her faith, her art, and her untimely death. Find a story of hope in this tragedy. Cautionary Notes: Rated PG-13 for violence and other thematic material related to Columbine. Johnny While a foster child named Johnny is dying of leukemia, his doctor decides to improve the last few days of his life by inviting him to live with his family. Although his wife is concerned about losing yet another child, Johnny leaves this world only after making a huge impact on this family. Letters To God Tyler and Sam are both fighters. The difference is that Sam tends to get into fights at school, while Tyler is fighting cancer for his life! Tyler copes by writing, stamping, and mailing letters to God. Just what will the new mailman think! Moms’ Night Out A few moms decide to leave their childcare duties to the dads for a night while they enjoy a quiet dinner out. But this evening may just turn out to be anything but! Monumental: In Search of America’s National Treasure Kirk Cameron hosts this documentary about the spiritual force behind the pilgrims’ decision to leave England and the shaping of early America. October Baby Following yet another seizure, Hannah discovers in the hospital that not only is she adopted, but she is a survivor of a failed abortion! When a few of her college friends go on a road trip, this could be an opportunity to find out her true identity and where she belongs.Cautionary Note: Rated PG-13 for in-depth medical details on issues such as abortion. Poverty, Inc. Many people want to help others around the world, but have you ever thought about what your money does when you donate it to charity? This documentary will help you determine which nonprofit business practices can help people in need, and which ones do more damage than good. Priceless James’ rough life capstones when he takes a gig driving a truck cross-country. Discovering the cargo he’s delivering makes James learn there are modern slaves whose lives are worse off than his own. And they may be closer to home than we think! This movie is produced by for KING&COUNTRY band. Cautionary Note: Rated PG-13 for realistic elements related to human trafficking. Soul Surfer This movie is based on the true story of Bethany Hamilton, who lost her arm to a shark while surfing at age 13. But her faith in God and determination encouraged her to get back on board, and eventually compete as a professional! Cautionary Notes: Athletic beachwear is worn throughout the movie. The 5 Day Adoption As parents of three kids, Todd and Barbara McCoskey were hoping to adopt one more, but they never expected a whirlwind journey of doctor visits, background checks, home studies, travel arrangements, and finally meeting their new daughter… in just 5 days! This documentary demonstrates the power of prayer and following God’s call in our lives. The Lost And Found Family When recently-widowed Mrs. Hobbes discovers that the only asset of her husband’s available to her is a house she never knew of, she goes there in hopes of selling it. But will the foster family that lives there change her decision? The Ultimate Gift Spoiled Jason thinks he’s receiving his grandfather’s inheritance, but what he really gets is a set of missions leading to an ultimate gift worth more than money. Jason’s self-absorbed ways may be left behind forever! To Save A Life As a kid, Jake’s life was saved by a friend who later on killed himself. This is just the beginning of many problems the popular partying basketball star faces. When a youth pastor meets up with him, can Jake turn all this bad into something worth living for? Cautionary Note: Rated PG-13 as this film revolves around many serious elements, such as suicide, teen pregnancy, self harm, and drug abuse. Unconditional Samantha has tried to find the murderer of her husband, an investigation that leads her to reunite with an old friend, Joe. Joe now runs an inner-city children’s ministry that Samantha is reluctant to get involved with, it may be the answer to restoring her faith and will to live. Cautionary Note: Rated PG-13 for inner-city and criminal elements. Voiceless Jesse Dean arrives to his new hometown to take on the role as a church outreach leader. Initially, the outreach is fairly typical.When he discovers that there is an abortion clinic just across the street, Jesse believes that this is the kind of outreach that God sent him to Philadelphia for. Cautionary Note: Rated PG-13 for issues surrounding the pro-life theme. When the Game Stands Tall A Christian high school football team experiences its first loss in over a decade. It’s a dark time for the team, and not just when they’re in gear. This may mean that lessons need to be learned off the field in order to get back in the game. War Room To others, their lives of the Jordan family may look great. When Elizabeth Jordan meets her new client, Miss Clara, she ends up with much more than just a house to sell! Miss Clara challenges Elizabeth to take her prayer life to the next level. This includes clearing space for a War Room, or a prayer closet set aside for a spiritual battle plan. But what good will this do when the family’s secrets come to surface? Note: Because some of the following are currently-airing series, we cannot guarantee that they will uphold the same God-honoring values we’ve found in them in the past. Please watch with discretion. Hitting the Breaks A comedy about a recently-retired race car driver who moved his family to a hotel in a funky Colorado town. The Bible A faced-paced dramatic series highlighting the stories and history of the Bible. VeggieTales A classic family-friendly cartoon with Biblical values and talking vegetables! 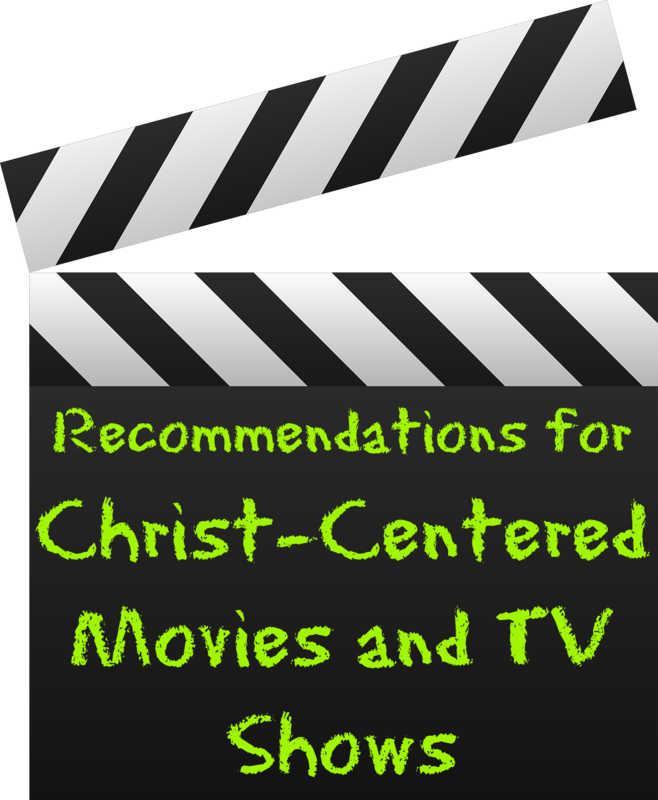 Note: The recommendations above are based on Girlz 4 Christ’s staff opinions. Movies that link to PureFlix or Amazon may be affiliate links.